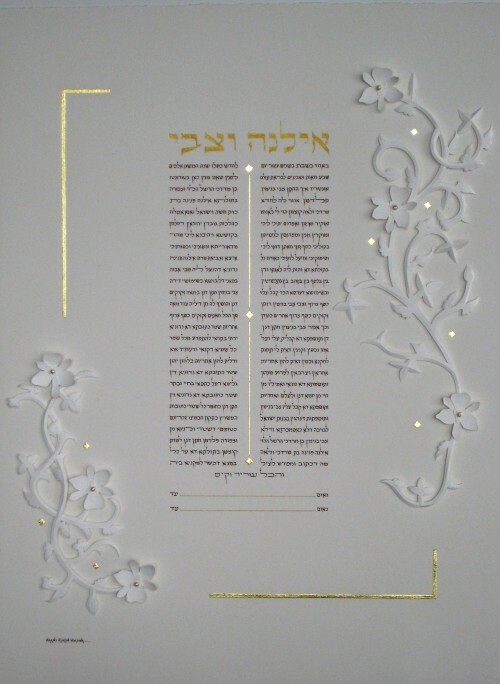 Orthodox Ketubah text is written in brown, and some of the letters are filled with gold paint. The illumination is done in the Paper-Sculpture technique with Orchids which have freshwater pearls and silver studs nesting in them. The 23K Gold Leaf is a nice accent to contrast with the white on white design. The names of the Bride and Groom are written in Hebrew above the Ketubah text.